Narrows Outfitting is a family run operation located just a 2 hours North-West of Winnipeg, Manitoba. We offer non-resident whitetail deer, black bear & waterfowl hunts as well as trophy fishing. All big game hunts are all-inclusive and fully guided with a 1 guide to 3 hunter ratio which insures our hunters get all of our attention. Our black bear hunts are in GHA 24 and GHA 19-B located just West of Lake Manitoba in the South Interlake and also GHA 25 East of Lake Manitoba. 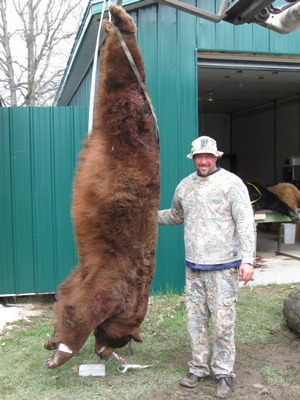 Bear stands and baits are set on both private and crown land. You can hunt with a rifle, muzzle loader or archery. All four color phases of the black bear are found here (black, cinnamon, blonde and chocolate) with the black being the most dominant. Our deer hunts are in GHA 19-B and GHA 25 where some of the largest deer in the Interlake are taken each year. See Manitoba Conservation for more information. ©2008 Narrows Outfitters - ALL RIGHTS RESERVED • Design by Ecliptic Technologies, Inc.